MSRP $80,805. ElkRidge luxury 5th wheels offer the ultimate in leisure living. 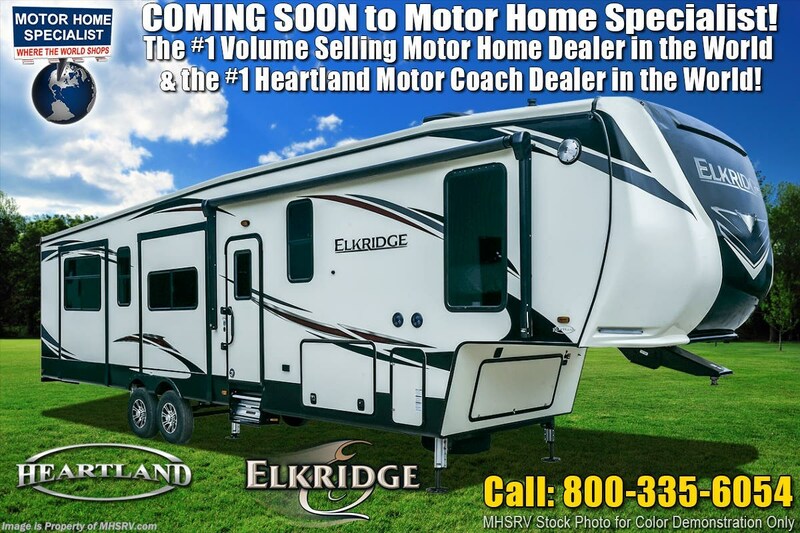 The New 2020 Heartland Elkridge 38RSRT fifth wheel RV approximately 41 feet 9 inches in length featuring a king sized bed and 2 full baths. Options include 6 point automatic leveling system, 72" Tri-Fold sofa IPO rear bunk, booth dinette IPO free standing table & chairs, salon style sofa IPO FS dinette & sofa, bedroom TV, dual pane windows, cold climate control package and a ducted second A/C. This beautiful fifth wheel also includes the Elkridge Summit Package option which includes high gloss sidewalls, painted fiberglass front cap, aluminum framed & laminated sidewalls, tinted safety glass windows, F rated tires, sixteen inch aluminum rims, spare tire, EZ Lube Dexter axles, Nev-R-Adjust brake package, MorRyde 3000 suspension, 50 amp service, universal docking station with black tank flush & exterior shower, heated & enclosed underbelly, slam baggage style doors, stop/turn/tail lights, twin 30lb. LP tanks, back-up camera prep, power awning W/ LED light, solar prep and quad aluminum entry step. For more complete details on this unit and our entire inventory including brochures, window sticker, videos, photos, reviews & testimonials as well as additional information about Motor Home Specialist and our manufacturers please visit us at or call 800-335-6054. At Motor Home Specialist, we DO NOT charge any prep or orientation fees like you will find at other dealerships. All sale prices include a 200-point inspection and interior & exterior wash and detail service. You will also receive a thorough RV orientation with an MHSRV technician, an RV Starter's kit, a night stay in our delivery park featuring landscaped and covered pads with full hook-ups and much more! Read Thousands upon Thousands of 5-Star Reviews at and See What They Had to Say About Their Experience at Motor Home Specialist. WHY PAY MORE?... WHY SETTLE FOR LESS? 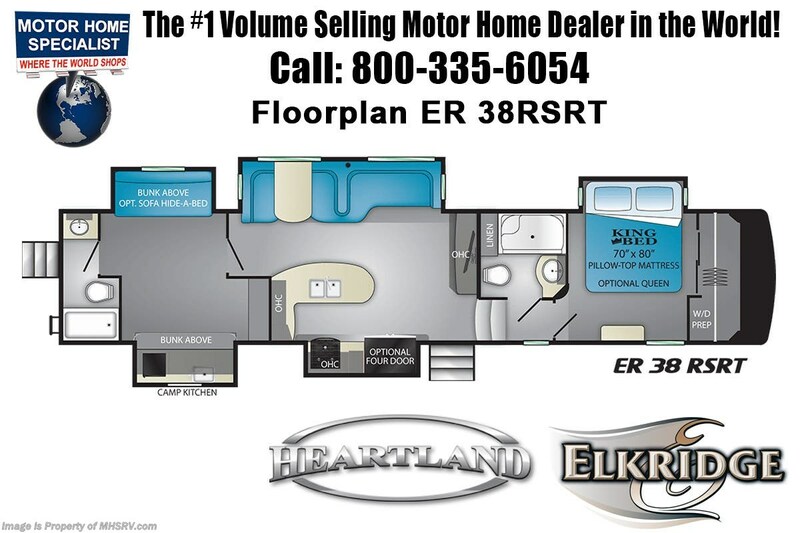 Check out Stock # MHL032019023 - 2020 Heartland ElkRidge ER 38 RSRT on heartlandrvsource.com!